Uprooted is a pretty traditional fantasy novel. It is the story of Agnieska, a simple country girl who lives in a small village located near a dangerously enchanted Wood. Nieshka's village is guarded by The Dragon, an old Wizard who selects a girl from the local village every 10 years as payment for his protective services of the people who live in the environs of the Wood. Everyone expects that Agnieska's best friend Kasia will be chosen by the Dragon but (unsurprising, at least to me) he chooses Nieshka instead. 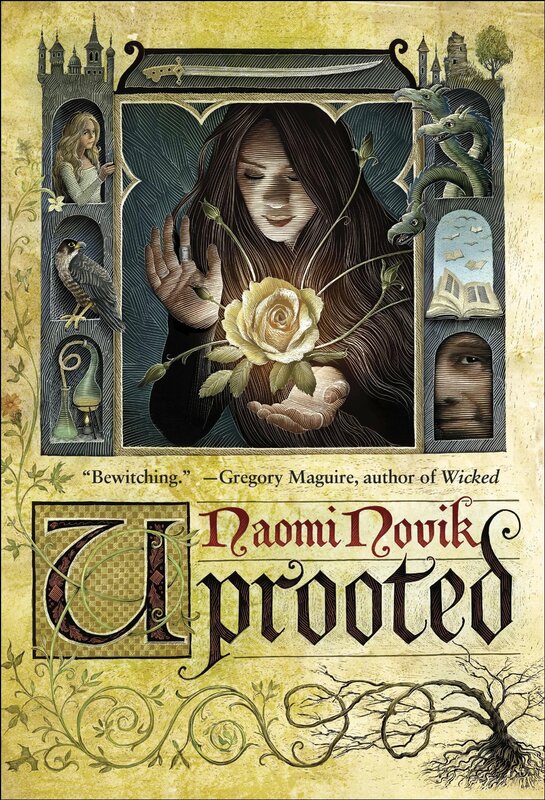 There is a lot of magic in Uprooted, as we discover that the reason Nieshka was selected is that she is an untrained Witch. (Of course she is. As usual, it just so happens that our main character just happens to have untapped resources of power waiting to be developed and acknowledged. Isn't this the basic plot of every Marvel movie released in 2016?) There's also a lot of battles and a (surprisingly) large amount of death. The stakes are real for the people in the book. As you might have been able to tell from my parenthetical comment above, one of the main faults of the book (to me) was the inclusion of too many clichéd fantasy tropes. Here is just an abbreviated list: young inexperienced farm girl, person who discovers they have powerful magic abilities, the palace intrigue, the very small village the main character comes from, the fish out of water scenes when the rube goes to the capital city, the battle of magicians, the ancient evil of the enchanted forest, the siege of hero by a numerically superior armed force, et cetera. For lots of other people they may have gained comfort from the familiarity of these tropes but to me they were mostly just annoying. I like fantasy "well enough" but it's not my go-to genre. Examples of fantasy I have read relatively recently that I enjoyed quite a bit would includes works by Brian Staveley, Michael J. Sullivan, Robert Jackson Bennett, Daniel Abraham and N.K. Jemisin. Those books include lots of suspense, action, wonder (sometimes humor and often diversity), built around complex, memorable characters. These books use and then disrupt fantasy tropes. To me, Uprooted also uses fantasy tropes and perhaps is trying to invert them in some way but mainly ends up re-inscribing them. There is definitely action and suspense in Uprooted but I simply did not care about either of the two central characters and it is definitely lacking both a sense of fun and a diverse perspective. Additionally, I was almost driven to distraction by the young adult (YA) romantic scenes of "tension" between the young, inexperienced girl and older, emotionally distant, experienced magician. However, overall I would still say that Uprooted is a well-crafted, quite traditional fantasy novel brimming with magic and mayhem, with a somewhat bewildering ending that simply failed to resonate with me. Date Published: March 1, 2016. Date Read: August 8-13, 2016.